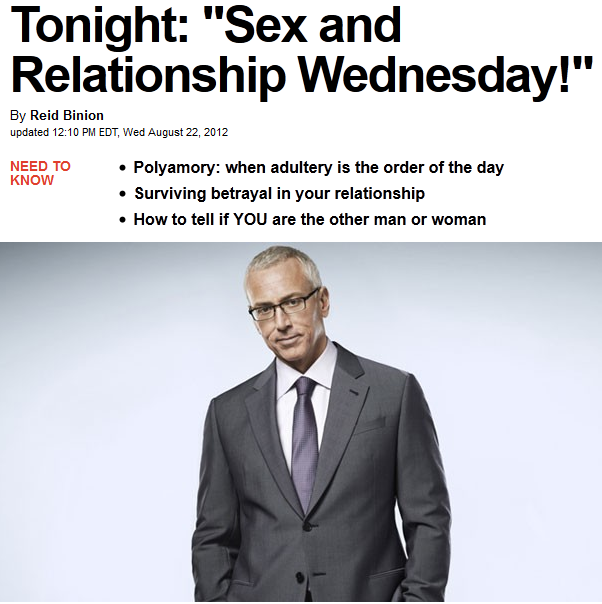 Polyamory in the News: Showtime's poly quad goes on Dr. Drew tonight. Uh-oh. Showtime's poly quad goes on Dr. Drew tonight. Uh-oh. The quad from Showtime's now-concluding Polyamory: Married and Dating (the final episode airs tomorrow night, Thursday Aug. 23) will appear tonight (Wednesday) at 9:00 Eastern on HCN's Dr. Drew Show. Chatter on the Polyamory Leadership Network is that Dr. Drew is known for being very hostile to non-monogamy, and that the quad better have a plan in place and sound bites on the tips of their lips. 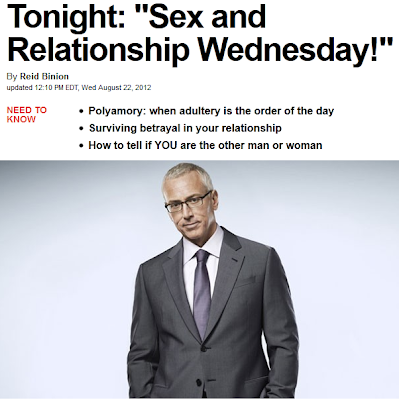 Tonight on the Dr Drew Show: It's been called "shocking," "titillating" and "cringe-inducing" -- Showtime’s new series called "Polyamory: Married and Dating" -- real-life couples that seek relationships with other lovers. Dr. Drew asks them how they make their lifestyle work in a world built for monogamy. Let's be ready to jump into the comments early (scroll to bottom of the page). P.S. : Kamala posts that she and Michael have also been filmed for the Ricki Lake Show. I watch Polyamory on Showtime and it seems to me that Jen is having a harder time adapting to the new living arrangements. It seems like Kamala picks at her about little things (like when she was yelling to get Tahl's attention) constantly criticising, and it seems that Jen is more akward and uncomfortable. I thought the whole idea for poly was open honest love, not pointing out other people's weaknesses and vulnerabilities. I think Jen is a wonderful person and I hope to see this poly relationship get better and hope to see Jen happier.